Though it pains me (and the kids even more) to be writing this, we have come to a stage where we can't manage to keep our dog and we're looking for a new home for her. 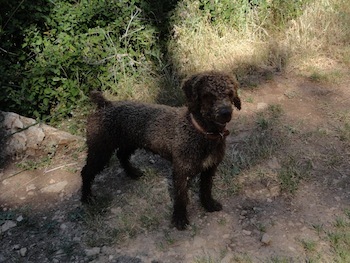 She is a Spanish Water Dog (with papers), chocolate and white, four years old. She is exceptionally intelligent. She has always lived with small children and is very gentle. I have had to return to work full time and am on my own with four children. Although we love her, we simply can't dedicate the time to her that such an active breed requires. She needs to be with a very active family (preferably with some land) and, most importantly, her mind needs to be kept active. She's a working dog and she will do anything for you but, I have to be honest, if she is bored she will make her own fun. She is not in any way destructive but she will escape. She just wanders around for a bit and she always returns but it's actually illegal and we have no way of keeping her in (she is very agile) without tying her up, which we don't want to do. When she is out for a walk, she will stay by your side, she rarely barks (unless to advise you of a genuine threat) and has never been problematic with other dogs. I can email photos if you are interested. But please think carefully. She is a stunning dog but she is a handful. You can train her to do just about any trick in about five minutes and (when she is with you) she is very obedient but she would like to challenged all day and we simply can't offer her that.